Flight Club and Brooklyn Vintage Club have created a temporary time machine to take fans back to the glory days of the ’90s basketball lifestyle. The two joined forces to pay homage to the 2017 NBA Finals matchup between the Cleveland Cavaliers and Golden State Warriors by returning to 1994 to the matchup between the Houston Rockets and New York Knicks. 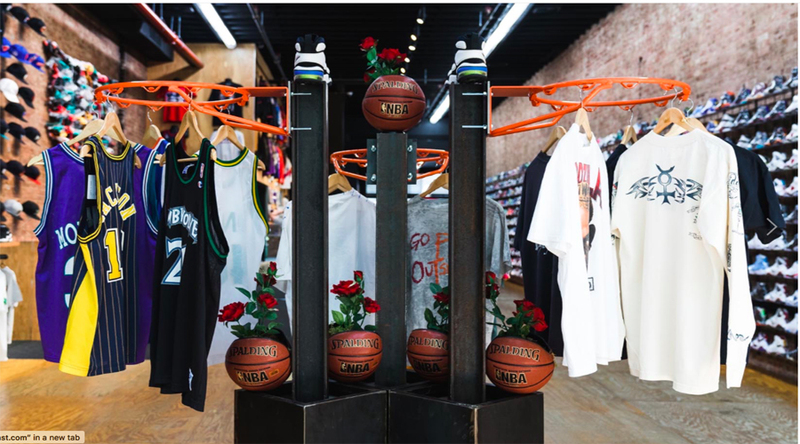 Sections of Flight Club’s New York City location were decked out with nostalgic pieces, including an entertainment setup facing Game 7 that was interrupted by the infamous OJ Simpson Bronco chase on June 17, 1994. As you move through the space you are immersed in days past with pieces such as an all-red Jeff Hamilton jacket sporting all NBA logos in addition to a display with authentic draft lottery cards. A special section is also curated of vintage Warriors and Cavaliers pieces to celebrate the rivalry between the two squads. You will also find many Dream Team pieces plus a display inspired by the true basketball roots of New York constructed using real construction beams and basketball rims. The space is topped off with a display of vintage clothing tags from the likes of Eastbay, NBA, Champion, Nike and many more.